This trip was never going to be a picnic, but meetings over breakfast, lunch and supper were a lot to take in. Born in Jerusalem and raised in a politically-minded, Orthodox family Hagit Ofran is the Director of Peace Now’s Settlement Watch team, where she coordinates the most comprehensive independent database on settlements, collects and publishes reports regarding settlement development and policy and has been involved in providing evidence for several appeals, the majority of which deal with illegal settlement and outpost construction. Settlement Watch was established to bring to the attention of the Israeli public information regarding what is being done on the eastern side of the Green Line. Settlement Watch believes it is extremely important for people to be familiar with basic facts as a condition for carrying out informed discussions about the future of the State of Israel’s control in the territories. Machsom Watch is a volunteer organisation of Israeli women who are peace activists from all sectors of society. Since 2001 the Machsom Watch volunteers have been observing and reporting on the Occupation. On a daily basis they monitor the West Bank checkpoints, the separation fences, the agricultural gates, the military courts and Palestinian villages. They document what they see and what is reported to them by local Palestinians. Through their observations, reports, films, photographs and tours they aim to influence public opinion in Israel and throughout the world by recording and authenticating the impossible conditions faced by the Palestinians under Israeli occupation; conditions which also corrode the fabric of Israeli society and the values of democracy. They attempt to ease the frustrations and hardships of Palestinians by offering assistance wherever they can. On the way we stopped on the Green Line (upon entering rd. 55) You can see where on the map where there is a kink in the Green Line just under Qalquiliya. There is nothing to see there except for agricultural land. Nothing to indicate that it is actually West Bank land and not Israel. We then continued to Alfe Menashe, an Israeli Settlement, which can be seen on the map. The big grey-blue area well within the West Bank. We visited a wonderful garden centre that used to have clientele from both Israeli and Palestinian. 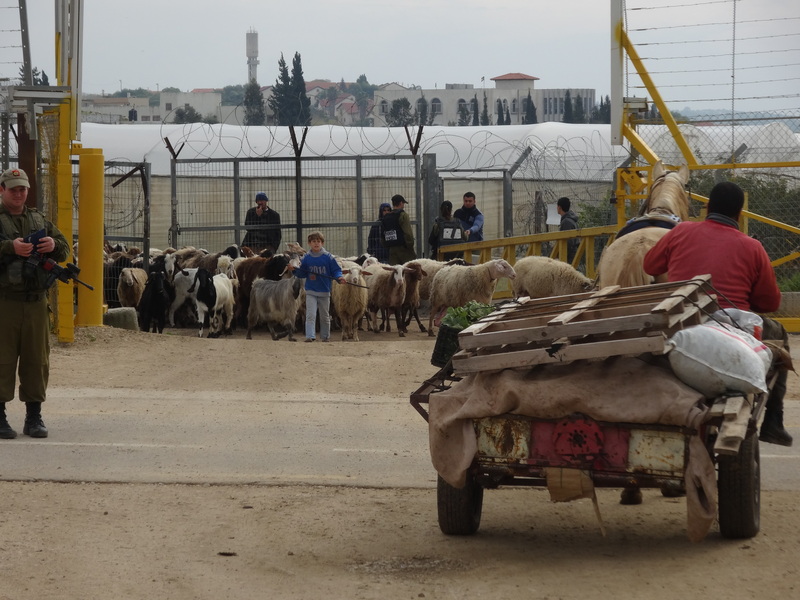 Now it has been divided from the Palestinians by the Separation Barrier and the industrial area has become a sort of no-mans land between Israel and the West Bank. It is hugely complex, but look carefully at the map and you can see clearly how the Israeli separation barrier (in red) winds its way around Israeli settlements deep into the West Bank and well away from the Green Line. Israel is the grey area to the left. This divides Palestinians from Palestinians and from their farmland and businesses. Habla Agricultural Gate is the green X where Palestinians can get to their land just beyond the nursery which is open twice a day. We Met Hussein in Nebi Elyas, which can be seen just above the red line immediately above Alfe Menashe. You can see the narrow corridor into the West bank, that the Separation Barrier has created with Qalqiliya, a large Palestinian town, almost cut off from the rest. We were shown some of the challenges that Nebi Elias endures because of the settlements, including the huge loss of agricultural land, the lack of room for any expansion of the village and the sewer overflow pipe leading from the settlement straight onto the remaining village land. Finally we were taken to see a Palestinians home that was unlucky enough to be on the edge of a village that has an Israeli settlement built right up to it. It is called the The Lone House in Elkana. The Separation Barrier has been built between the house and the rest of the village. There is an agricultural gate for access to the village, which is opened just twice a year! If you look very closely at the photo to the left, you will see the Wall with a yellow gate next to it. The family have a key to this gate so that they can cross to the rest of the village, but no one from the village is allowed to cross over to their home. No family or friends allowed. The photo to the right shows the Lone House not at all clearly, but I am sure it can be Googled! You have no idea how gratifying it is to lead a tour with people like you. It is not the fact that you belong to the converted which makes the difference but the interest that you take, the intelligence with which you grasp the atmosphere and the problems and obviously the sympathy that you radiate. So now I’ve had one Yachad Students’ group and a Yachad Women one and there is a common characteristic which I find so admirable and I think I’ve already mentioned – the fact that you care so much about something that is for you by and large overseas. It helps a great deal and we, my Machsomwatch colleagues and I, are very grateful. I hope (and actually am sure, if Hannah and Yachad are involved) that your stay was what you expected it to be and thank you again for being such a wonderful audience and such great company. As promised, here are the links to what takes place in the mornings at 2 border checkpoints which people need to go through every day on their way to work, school, medical appointments, etc. 6-8pm Meeting with a group of female settlers from Efrat in Gush Etsion Winery. We spent 2 hours at the Israeli settlement Efrat and were met by 3 rather powerful settler women and one man. They gave us a speech, told us how wonderful everything is in the settlement, how well they treat the local Palestinians, how we could not possibly understand, how upset they are at the idea that any Diaspora Jew would not support Israel with its little mistakes 100% as it is like a family and you support your family despite their little mistakes, don’t you? And they sidestepped every question and pretended not to understand others and just spouted set propaganda. That was the first time that I just sat back because I realised that saying anything much was a waste of effort. I was worried that the others did not feel the same and was relieved that we all collapsed on our bus and agreed with each other. 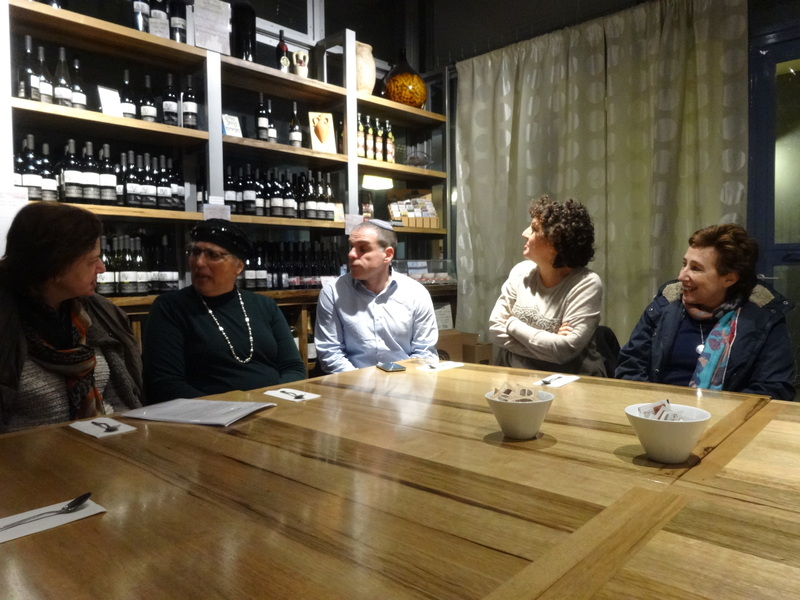 An opportunity to meet with a group of women from the settlement of Efrat and discuss with them why they choose to live in the West Bank and what they believe the future holds. Efrat Efrat (Hebrew: אֶפְרָת ), or previously officially Efrata (Hebrew: אֶפְרָתָה ), is an Israeli settlement established in 1983 and a local council in the Judean Mountains of the West Bank. Efrat is located 12 kilometers (7.5 mi) south of Jerusalem, between Bethlehem and Efrat had 9,238 residents as of January 2013. Although it is geographically located within Gush Etzion (“Etzion Bloc”), Efrat is independent from the Gush Etzion Regional Council. Since November 2008, Oded Ravivi, an attorney and lieutenant colonel in the army and member of the Likud Central Committee is the head of Efrat regional council.